Annawan invites you to grow with us and has its eye on development. We welcome change, and the Village is committed to new opportunities while preserving the small town feel our residents have known for generations. The Village of Annawan offers excellent municipal services, a strong workforce and a favorable tax base. Annawan is located at exit 33 off Interstate 80 and intersects with Illinois Route 78 and U.S. Highway 6. The commercial/industrial 633-acre park is highly visible off Interstate 80. It is an ideal home for small to medium sized business. It is home to Patriot Renewable Fuels, LLC ethanol plant and future home of a bio-diesel plant. 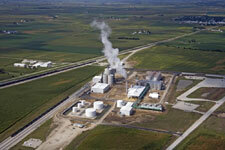 Commercial and Industrial Park is home to Patriot Renewable Fuels, LLC ethanol Plant. Plans are in the works for a bio-diesel plant.